DUBAI - The Department of Economic Development (DED), Dubai, has signed a partnership agreement with the Talal Abu-Ghazaleh Organisation (TAG-Org) to offer added value packages to the business community and develop the exclusive services being provided at the Dubai Business Club in DED. His Excellency Sami Al Qamzi, Director General of DED, and His Excellency Dr. Talal Abu-Ghazaleh, Chairman of TAG-Org signed the partnership agreement today in the presence of senior officials from both sides. The partnership aims to provide businessmen and investors who seek to do business in Dubai with the highest levels of customer service excellence and promote overall business performance in accordance with best global practices. Talal Abu-Ghazaleh & Co. International will be responsible for the day-to-day supervision, management and operation of the Dubai Business Club, as well as the implementation of the Global Star Rating System for Service Centres introduced by the UAE Prime Minister’s Office (PMO). The Dubai Business Club is currently rated six-stars under the System. "The Department of Economic Development is keen to reinforce the Dubai Business Club as a one-stop shop that meets all needs of businessmen. 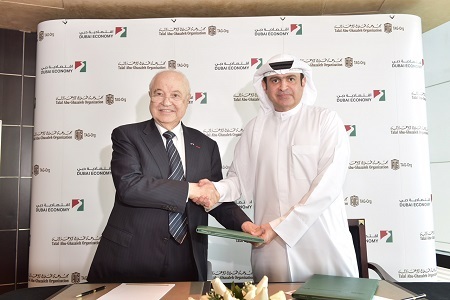 We are pleased to be partners with Talal Abu-Ghazaleh & Co. International as we seek to retain the six-star rating for the Club in the Global Star Rating System and develop it further into a seven-star facility by providing more value-added services in partnership with the private sector,” said Al Qamzi. "Talal Abu-Ghazaleh & Co. International has extensive global experience in providing and developing world-class services. We are confident that in the next stage the Dubai Business Club will provide services that further exceed customer expectations and we look forward to receiving more members and VIP customers at the Club,” added Al Qamzi. Dr. Abu-Ghazaleh said he is honoured to be partners with DED, which he called an international role model in delivering government services to citizens and investors worldwide. “DED has a major role in enhancing Dubai's international standing and in leading innovation in line with the vision of His Highness Sheikh Mohammed bin Rashid Al Maktoum, UAE Vice President and Prime Minister and Ruler of Dubai. Talal Abu-Ghazaleh Group will further facilitate customer access to the services provided by DED and other government entities at the Dubai Business Club,” stated Abu-Ghazaleh. The Dubai Business Club will continue to serve customers according to Dubai’s reputation and the expertise of Talal Abu-Ghazaleh Group in all areas of professional and advisory services, enabling businessmen to take their businesses to the highest international levels of excellence, added Dr. Abu-Ghazaleh. Together, DED and Abu-Ghazaleh & Co. International will work to provide customer services that improve overall competitiveness and sustainability in Dubai. In addition to the Dubai Business Club bouquet of services, Talal Abu-Ghazaleh Organization will offer administrative and legal services, market research and management studies, feasibility studies, tax services, accounting, and intellectual property services. The services of the Dubai Business Club are divided into two categories - for members, and non-members. DED will continue to monitor the development and quality of the customer services provided at the Club, which is a first-of-its-kind premium facility in Dubai. GNSO Review 360 Assessment: Participate and Make Your Voice Heard!